Menopause Facts: How do I know if I am in Peri-menopause? Just for clarity Peri-menopause is the time leading up to your last period. During this time you may (or may not!) start to feel the changes associated with an unbalanced endocrine system both on a physical and psychological level. Most women think that the only symptom they will experience is a change in their menstrual cycle, however, there are no less than 33 possible other symptoms which you may (or may not!) be experiencing in the run up to that last period. Hot flushes, night sweats, irregular periods, loss of libido, vaginal dryness, mood swings, tiredness, hair loss, sleep problems, lack of concentration, memory problems, dizziness, weight gain, incontinence, bloating, allergies, brittle nails, changes in odor, irregular heart rate, depression, anxiety, irritability, panic disorder, breast pain, headaches, joint pain, burning tongue (! ), feelings of electric shock, digestive disorders, gum problems, muscle tension, itchiness of the skin, tingling of the extremities, osteoporosis. How do you know it is your last period? The main signal is going without a period for at least 12 months. A GP can take a blood test to determine a woman,s FSH (follicle-stimulating hormone) levels. When a woman's FSH blood level is consistently elevated to 30 mIU/mL or higher, and she has not had a menstrual period for a year, it is generally accepted that she has reached menopause. However, it depends on the time of the month you actually have this test as to the levels of your FSH, so is therefore not definitive. So, I think the first step is to get to know your own body and mind at this changing, sometimes challenging time of our lives. Get to know what it likes and dislikes, how it likes to move, what lights it up and what (or who) drags it down. Peri-menopause can sometimes be like a roller coaster ride, ups and downs, highs and lows, these need to be ridden and conquered, which can take courage and the willingness to adapt to change. Every woman has a different experience, we are all unique! The first step is to become AWARE of your body. The symptoms will come and go at varying levels, forces and durations. Putting simple lifestyle habits into place can make a huge difference to the severity of these symptoms. Come along and listen to Susan outline some of those lifestyle changes at our Well Fest East Mids event. 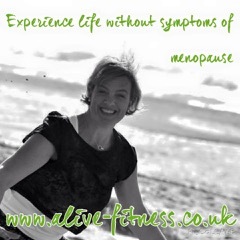 Susan Booth from ALIVE Fitness, will be talking about the Highs and Lows of Menopause at the Well Fest Event at The Roundhouse, Derby on 29th September. Click HERE to get more info on this event now.